Toxicological behavior of ambient particulate matter, nanoparticles, diesel and biodiesel particles on lung macrophage cells, forms the main basis for the current research work carried out by me at SEE, CityU. These particles were reported to elicit pulmonary and cardiovascular disorders in adults, and autism spectrum disorder in children. The current research work focuses on how aerosols in the atmosphere with different sources, sizes and physicochemical properties elicit the cell toxicity. These projects can be summarized into 3 sections 1) Seasonal and Spatial variation of water soluble ambient fine and coarse PM, 2) Toxicological changes implicated by water insoluble TiO2 nanoparticles, and 3) Comparative analysis of Diesel and Biodiesel particles with reference to cellular toxicity. 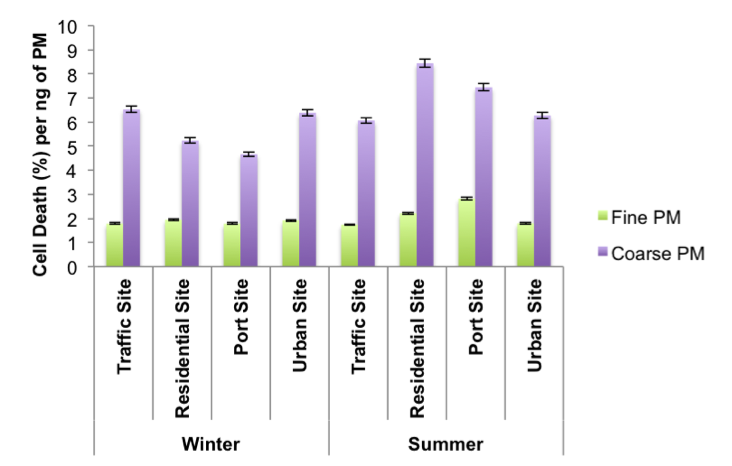 The overview of these projects was presented as shown in Fig 1. Cellular toxicity was determined by MTT assay, and ROS generation was determined employing DCFH-DA probe on PM exposed RAW 264.7 cells. 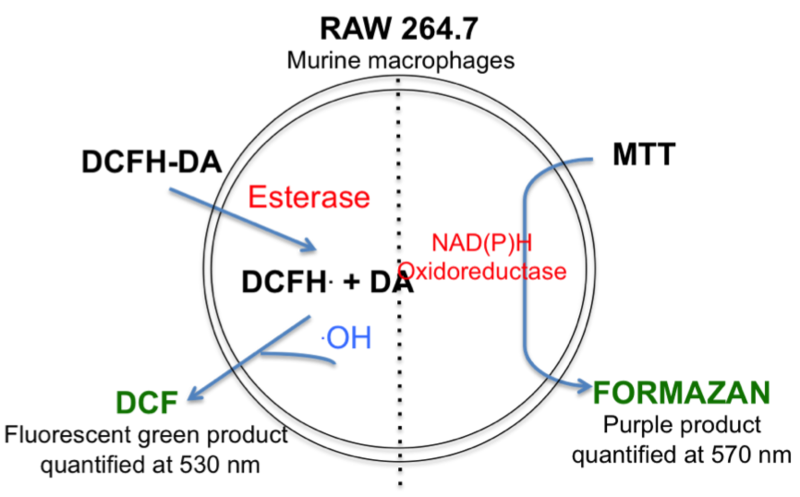 Brief overview of these mechanisms was depicted in Fig. 2. 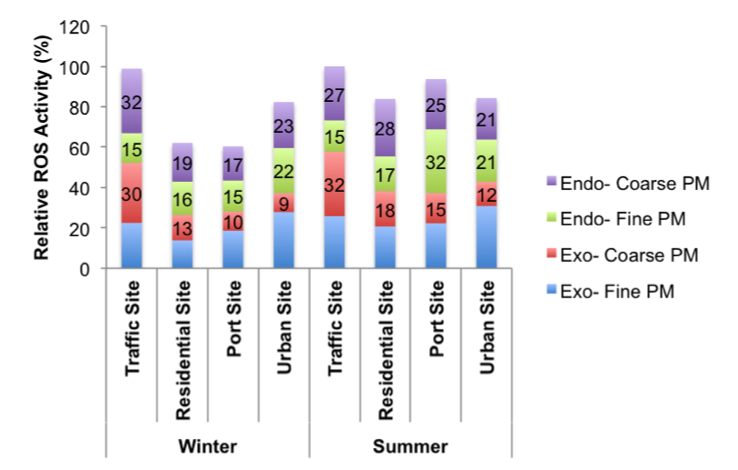 Ambient fine and coarse particulate matter was collected from four different locations of Hong Kong defined as Traffic, Port, Urban and Residential sites during winter and summer seasons. Invitro assays employing RAW 264.7 macrophage cells were carried out to determine cell viability (MTT) and Reactive Oxygen Species generation (DCFH-DA) both volumetrically and mass based, on exposure to water soluble particulate matter for different time intervals of 4, 24 and 48 h. During both seasons Traffic site samples resulted in higher generation of toxicity, followed by Urban, Port and Residential sites (Fig. 3). 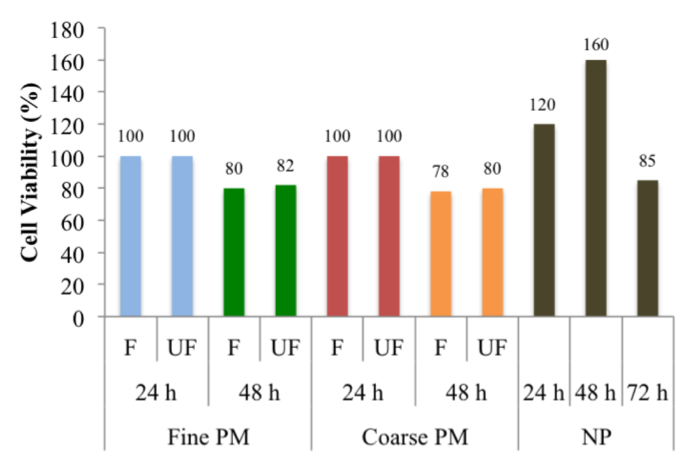 It is also observed that coarse PM was highly toxic than fine PM, when analyzed on mass basis (Fig. 4). Potential health risks involved in TiO2 nano-coating on textile fabric to attain self-cleaning capability, was evaluated through quantification of generated free radicals and cellular toxicity by TEM and FACS. Induced ROS generation was found 10-20% decreased and cell viability increased 20-60% till 48 h and loss of 15% compared to untreated control RAW 264.7 cells. 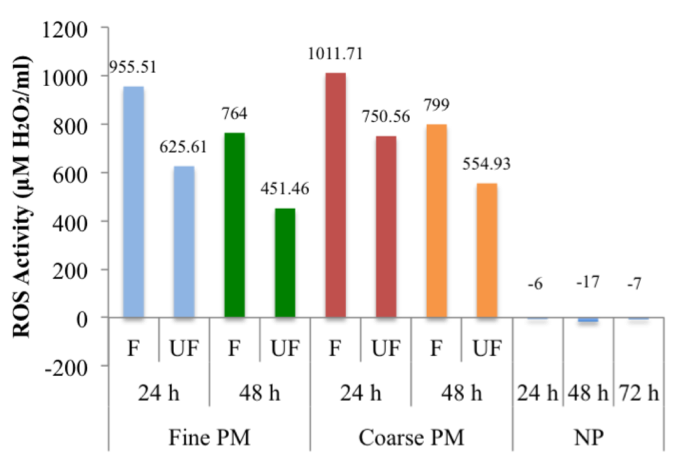 As these nanoparticles remain as insoluble in water, a comparative analysis was made for them against filtered and unfiltered ambient fine and coarse PM (Fig. 5 & Fig. 6). Cellular damage by these nanoparticles was examined through transmission electron microscopy (Fig. 7). Diesel particles are considered as carcinogenic by WHO. These particles in agreement with organic matter are considered as Biodiesel mainly generated from domestic and renewable sources. Their health risks are analyzed in this study by determining ROS and Cell toxicity and results are compared in accordance with the functional groups of these particles where the data was obtained from FTIR and UV-Visible spectrophotometer.